A freshen-up did Lim’s Pride a power of good as evidenced from the way he rattled home for a thrilling last-gasp win in the $20,000 Open Maiden Division 2 race over 1400m on Friday night. Trainer Steven Burridge tipped the Casino Prince four-year-old out after his first two starts – both on Polytrack – that produced mixed results. He ran an encouraging second to Paddington on debut in August, but went backwards second-up, beating one home three weeks later. The 47-day break ensued, with Lim’s Pride returning an improved horse. Stalking up the speed in fifth place, the $12 favourite showcased his true ability with an electric turn of foot inside the last furlong to reel in the fighting pair of Sacred Tonic (Craig Grylls) and Mai Darko (Amirul Ismadi). Lim’s Pride (Troy See) motors home to blouse Sacred Tonic (Craig Grylls, obscured) out. Though it looked like he was lugging in under pressure, Lim’s Pride might have actually been homing in on Sacred Tonic, who had taken the measure of Mai Darko at the 150m. With See pulling out all the stops, Lim’s Pride chased hard to eventually jag a head victory from Sacred Tonic with Mai Darko dropping out late to finish third another 1 ½ lengths away. The winning time was 1min 23.94secs for the 1400m on the Long Course. “He had a nice freshen-up. He went good on debut on Polytrack and then got lost second-up,” said Burridge. “The let-up has brought him on. He put on some weight and he toughed it out tonight. 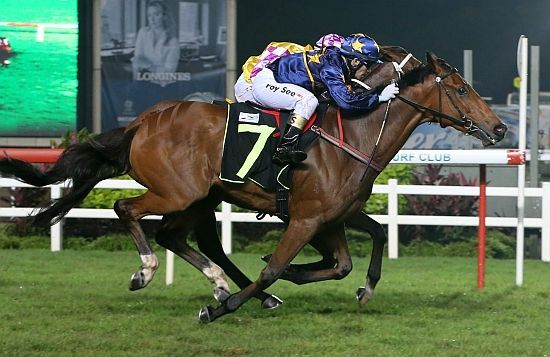 See, who has forged a successful partnership with the Lim’s Stable of late (four of his last five wins have come in the blue and yellow silks of the multiple champion owner), said easing Lim’s Pride back in maiden company was a huge factor. “I rode him at his first run and he went good. Then he raced in Novice company, which was probably too strong for him,” said the current leading apprentice jockey.